This trip is available from May to the end of September. Starting time is 8:30 a.m.
You may book as one person. The trip runs with a minimum of 5 participants. 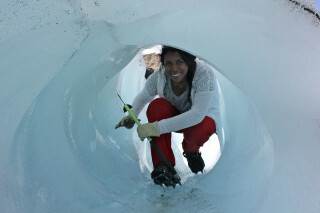 No previous glacier experience is necessary, but participants should have a decent level of physical fitness. Pickup is possible from Interlaken hotels and the Interlaken Ost and West train stations. After the activity, you will be dropped off where you were picked up. If you need to arrange a meeting point, please let us know. What to bring? Please wear athletic sportswear and bring energy bars, a picnic lunch, lots of water, sunscreen, sunglasses, and a camera. 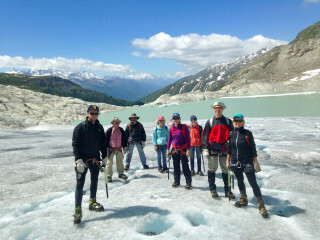 There are hikes, and then there are glacier hikes. 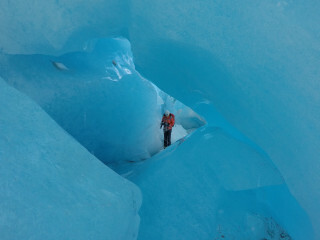 Walking over these massive blue ice formations seated high in the mountains is both a thrilling and humbling adventure. 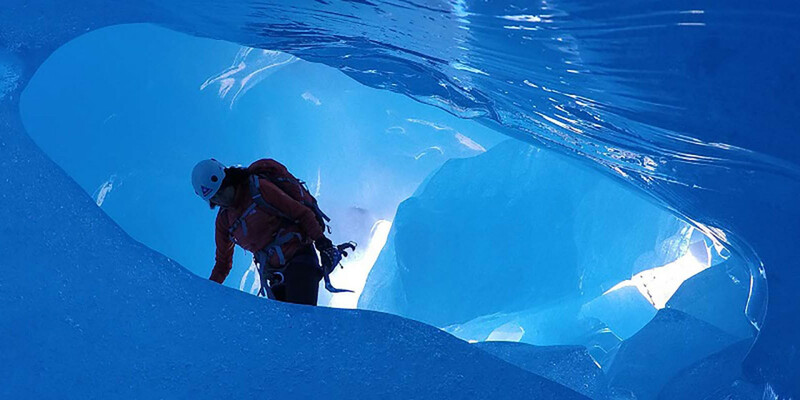 Explore the frozen wonderland of the Swiss Alps with a certified guide who teaches you all about glaciers and the environment. 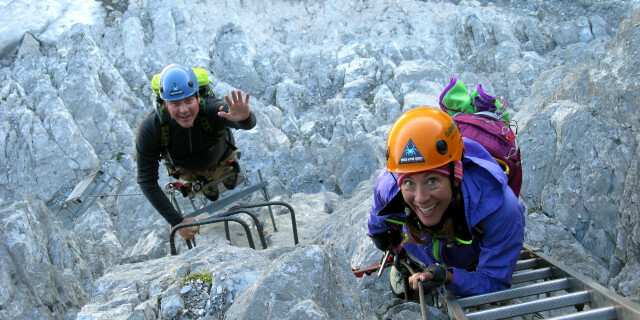 Interlaken is known as the gateway to Swiss Alp adventures. From your accommodation in the town, your guide picks you up for an hour-long drive to the activity location. You’re supplied with everything you need for a safe a comfortable trip, from glacier-hiking boots to a warm jacket. 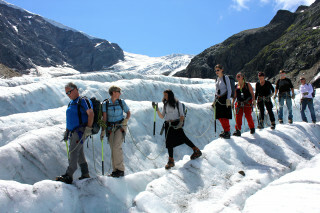 Depending on the weather, you explore either the Stein Glacier (Steingletscher) or the Rhone Glacier (Rhonegletscher). The Stein Glacier stretches on for 4 km and feeds into the serene Stein Lake, surrounded by a picturesque green valley. 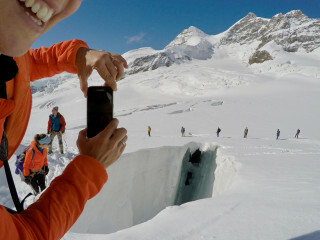 The large Rhone Glacier measures 7.65 km (4.75 mi) and hosts an icy cave where you can explore the glacier's insides. Enter an entirely new world of trekking. The landscape’s rocky formations around the glacier make for unique and memorable views. Learn more about the importance of these phenomenal frosty features as you admire their greatness. You trek for 4-5 hours to take in the atmosphere and the views. 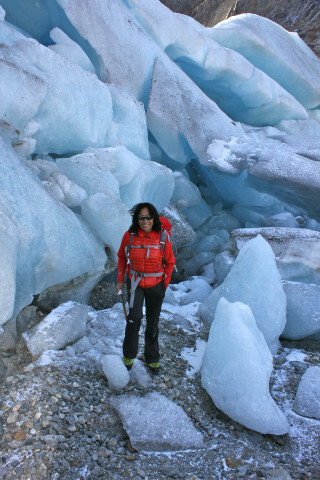 Hike through the icy patterns and shapes of a Swiss Alp glacier for a walk like no other. The fresh mountain air and the thrill of the frosty voyage stay with you long after you leave the frozen wonderland.